At Tulja Jewellers we offer a wide selection of South Asian jewellery ideal for weddings, engagements and special occasions. Our unique jewellery draws its influences from traditional cultural heritage as well as modern design, blending these influences beautifully to create a variety of distinctive, high quality jewellery ranges. Named after the Indian Goddess of Jewellery, Tulja’s stunning South Asian-inspired jewellery showcases superb craftsmanship and quality at excellent value for money. Our unique jewellery ranges offer something to suit every taste and budget for the multicultural customer. 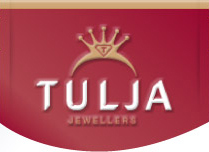 At Tulja we take pride in delivering a first class one-to-one personal service for each and every customer. Our distinctive jewellery includes South Asian inspired wedding sets, necklaces, earrings, bangles, rings and bracelets and is it available in a range of precious metals and gems. Tulja’s 22 carat yellow gold, 18 carat white gold and diamond jewellery is not only beautiful in itself but designed to enhance the beauty of each unique woman it adorns. Our Asian wedding sets are so special that often now, when people think of weddings, they think of Tulja. In addition to our Asian inspired jewellery, we offer Western style diamond jewellery, white gold, cruciform and wave patterned pendants with brilliants and baguettes, floral and triple-hoop clip-on earrings and Tiffany-style bracelets, each marked out by its superb craftsmanship.